Yea-Sacc horse yeast supplement is a natural, viable (live) yeast culture based on the Saccharomyces cerevisiae yeast strain 1026, the foundation strain of Alltech. Through years of intensive research, this yeast strain has been specifically selected for animal production, and has been a standard in horse diets around the world since its inception. Yea-Sacc is used as a dietary supplement to promote the performance of horses in all life stages. In the past 20 years, research into the effects of including a live yeast culture in the diets of horses has gained much attention. Research has shown that different strains of yeast have different properties. There are roughly 2000 strains known, yet they are not equally efficient in stimulating hindgut activity in animals. Consequently, the two most important considerations when choosing a yeast culture as an equine probiotic are: strain and the yeast must be alive. Of all strains tested, Alltech has identified Yea-Sacc to be the yeast strain most efficient in enhancing animal production. Yea-Sacc is the first live yeast with approval from the European Union for use in all horse diets. It has been shown to have beneficial effects on growing horses, broodmares, stallions, equine athletes, geriatrics, as well as pleasure horses. Yea-Sacc enhances performance by helping the horse extract nutrients from its feed. The large intestine and cecum act as fermentation vats, allowing for the digestion of roughage. The horse relies on microbes found in this lower digestive tract to ferment these dietary fibre sources and, in so doing, extract energy from hays, grasses and pastures. Even though this process is fairly efficient, more energy could be sourced from the same amount of roughage if the efficiency of microbial fiber digestion could be enhanced. 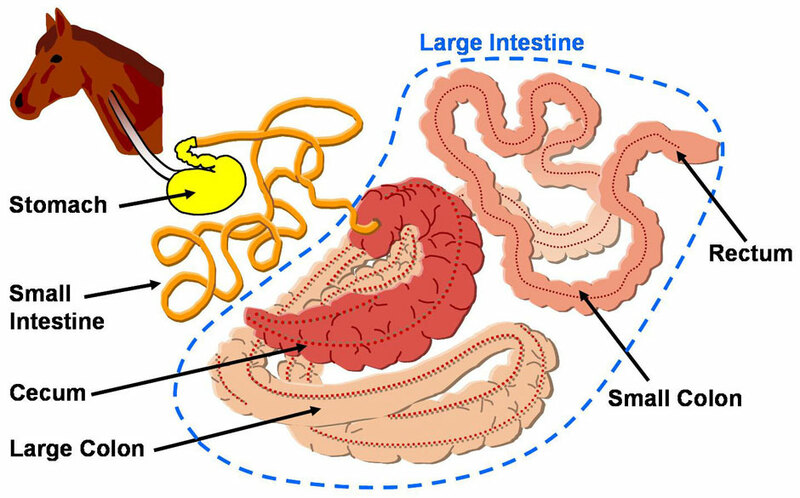 Live yeast culture in the form of Yea-Sacc enhances this process by stimulating changes in the cecum that encourage the fermentation of fiber sources in the diet. For this reason, Yea-Sacc is effective in, for instance, helping to achieve and maintain good body weight on geriatric horses and horses who struggle to keep condition by enhancing the digestion of feed nutrients. Performance horses are often fed high energy diets containing large amounts of grains and other starchy feeds. As a result, large quantities of soluble carbohydrates reach the hindgut, causing extreme pH fluctuations and contributing to a variety of related problems such as colic, laminitis and diarrhea. Yea-Sacc alleviates the incidence of such conditions by stimulating an increase in the number of bacteria responsible for removing lactic acid from the gut. This minimizes low pH (high acidity) associated with the intake of feed concentrates and encourages the fermentation of fibrous feeds, which naturally take place at a higher pH level, hereby ensuring normal and efficient digestive function. Phosphorus is a major structural component of bone, and is essential to both the growing and exercising horse. Yea-Sacc stimulates the activity of hindgut bacteria responsible for absorption of this mineral from the diet, hereby making more phosphorus available to the animal. In the same way, Yea-Sacc has been shown to benefit the absorption of both calcium and protein. Imbalances or deficiencies of minerals such as phosphorus and calcium have been linked to the incidence of Developmental orthopaedic disease (DOD) and other developmental problems in growing horses. Efficiency of protein utilization, essential to growth and muscle building during conditioning and muscle development of young and performance horses, such as the racehorse in training, is enhanced by the addition of Yea-Sacc, with nitrogen retention increasing significantly in growing horses. When considering the lactating mare, more energy and protein means better milk production. Improving feed digestibility by including Yea-Sacc in the broodmare diet means that the mare is able to produce more milk, resulting in more milk consumption by the foal. In addition, nutrient density of the milk is enhanced with respect to energy, sugars, fat, and protein, ensuring enhanced nutrient transfer to the foal, optimal growth and development, as well as an increased resistance to disease. With headquarters located in Kentucky, USA, Alltech has its roots firmly planted in one of the biggest horse industries in the world. Thus, it is no surprise that they have developed a range of products ideally suited to and widely researched in the equine industry. As the only non-pharmaceutical entry on the list of top 20 Animal Health Companies, Alltech has been providing natural solutions to the equine industry for over 25 years. With core competencies in yeast, fermentation and peptide technology, Alltech has succeeded in consistently providing products of superior quality backed by the independent research needed to guarantee the success of each of their products.